The jar design ensures that food ingredients are pushed on to the blade for faster cutting/grinding action, thus preventing it from spilling out and saving time and energy. The cord winder makes it easy to store the power cord after use making it compact and saving space. The specially designed handles for better grip and durability. 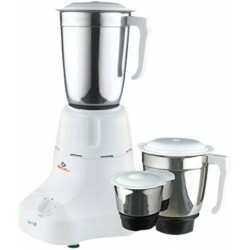 The versatile mixer grinder has multi utility jar. 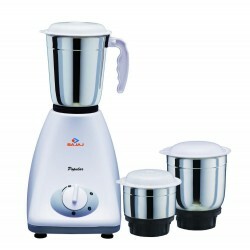 It not only performs wet grinding, dry grinding and juicing, The accessories make it ideal for Atta kneading, vegetable chopping. The jar base made of unbreakable, non-corrosive and high-grade nylon for durability. The super-efficient blades made of superior quality stainless steel can do better grinding of food ingredients according your requirements fine, medium or coarse. The 9 versatile, stainless steel blades to perform wide variety of operations like Atta kneading, vegetable chopping, mixing of masalas, whipping etc. The jar base is firmly secured with screws to ensure leak-proof and hassle free performance. 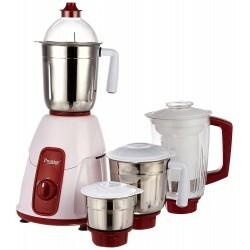 This mixer grinder has a 4-way coupler with interlocking vane for better locking and grinding thus making it extremely safe and efficient to use.